and likeness with the hairdo of the so-called "Sea-Peoples" has been found, like they are represented in the designs of Medinet Habu. These last ones have been connected to several peoples who composed the bands of pirates, which in the XII century b.C. plundered all the Middle East, from Troy to Egypt and perhaps also to Greece, provoking therefore the end of many civilizations, like that one of the Hittites. 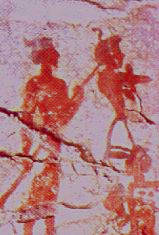 boats in the fresco of Thera? 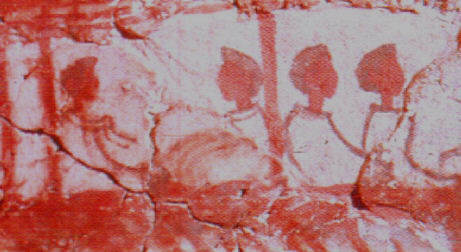 In an other part of the fresco, some soldiers, inside the city, seem to wear the same 'hairdo'. A more complete view of the Frieze with the Fleet in Thera, Akrotiri on Thera, very intresting also for many other particulars of Life in the Aegean Islands in XVII century b.C., can be found by the Site of the University of Oklahoma. The theory that the entire fresco shows an episode of the Fall of Troy ( 400 years before..! ) is fascinating. Who are the men represented in the boats? 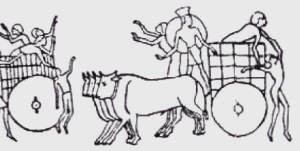 Minoans, foreign Ambassadors, traders.? 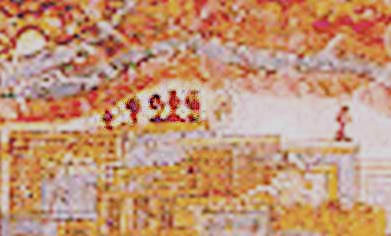 In any case, in a particular of the same fresco, in the image on the right, where rowers are represented, the kind of the hairdo seems to be similar, with the addition of a " pigtail ", that is very suitable for seamen, and more, it seems to exclude the possibility that, at least in this case, it could be an image, even though a much synthetic one, of a " helm ". Chronologically it exists a difference at least of four centuries between the two historical situations: Thera, island of the Cyclads, was destroyed from a cataclysm around the XVII century b.C.  (1625?) while the invasions of the Peoples of the Sea happened around the XII century and the Disk of Festos doesn't have a dating for the moment, but we can think that, being that kind of hairdo an ethnic indication or also a social status, was not subject to changes in that lapse of time. All this, sure, if all that has a meaning.